PALM COAST - Sections 1 through 19 . Florida Public Offering Statement - This Florida Public Offering Statement is for PALM COAST, SECTIONS 1 through 19. ( This was presented to each Prospective Buyer). 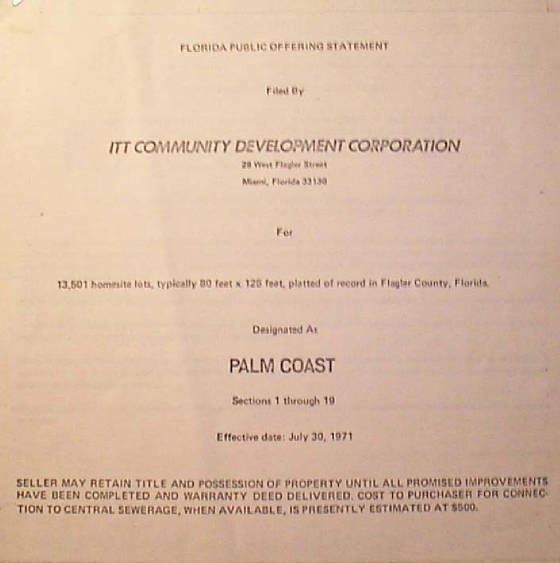 "This report is not a recommendation of endorsement of the offerings herein by the Office of Interstate Land Sales Registration, nor has that Office made an inspection of the property nor passed upon the accuracy or adequacy of this report or of any promotional or advertising materials used by the seller. Information contained herein has been filed with the State of Florida in the Office of Interstate Land Sales Registration. 7. Recreation - A golf course and club house have been constructed at Palm Coast and nine holes are presently ready for play. The Company proposes to construct a Yacht Club and Marina, which shall include tennis courts and swimming facilities. Tennis courts have already been constructed. 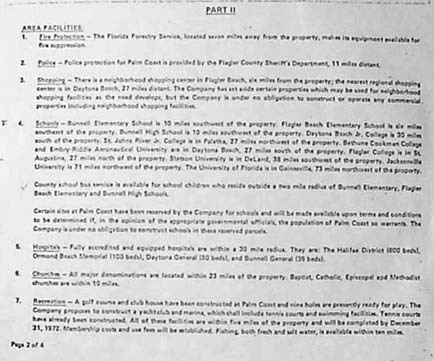 All of these facilities are within five miles of the property and will be completed by December 31, 1972. Membership costs and use fees will be established. Fishing , both fresh and salt water, is available within ten miles. Major airline connections are available at Daytona Beach, approximately 30 miles distant and bus service is available at Bunnell, approximately six miles distant. There is a non-commercial regional airport in Bunnell, 10 miles from the property. The Seaboard Coast Line Railroad stops at DeLand, approximately 33 miles from the property. We will remain Stewards of these Items hoping for a Museum like Flagler Beach already has, hoping for a Certified Local Goverment like so many other leading Florida Cities already are.